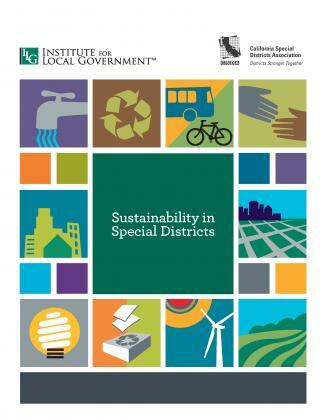 The Institute for Local Government’s Sustainability Best Practices Framework offers options for local action in ten areas. They are drawn from practical experiences of cities and counties throughout California. The options vary in complexity and are adaptable to fit the unique needs and circumstances of individual communities. Energy generation is the second largest source of greenhouse gas emissions. Thus, strategies to conserve energy and use it more efficiently in agency operations and the community help reduce greenhouse gas emissions. In addition, energy efficiency and conservation measures save money and resources. Green buildings reduce energy consumption, use water more efficiently and use materials with recycled content, thus saving money and natural resources and related greenhouse gas emissions. Local agencies have taken a variety of approaches to embrace green building policies and programs, consistent with the unique characteristics of their individual communities. The largest sources of human-generated methane, a potent greenhouse gas, comes from improperly managed landfills. Thus, waste reduction and recycling activities reduce the potential to generate methane at landfills, as well as reduces pollutants generated from transporting waste to disposal sites. Waste reduction and recycling activities also conserve natural resources. For related information see the ILG Commercial Recycling Resource Center. Energy generated from renewable sources produces less greenhouse gas emissions than energy generated from conventional sources. Low carbon fuels are those that are formulated to produce fewer greenhouse gas emissions. Transportation is the largest generator of greenhouse gas emissions in California. Efficient transportation systems, encouraging alternatives to single occupancy vehicles, and reducing the miles that vehicles travel can reduce greenhouse gas emissions, help conserve fuel and cut fuel costs, improve air quality, reduce traffic congestion and make streets safer for pedestrians, bicyclists, transit users and motorists. For related information see the ILG’s Land Use & Environment program. Well-planned communities with a balance of housing, jobs, shopping, schools and recreation can reduce the length and frequency of trips and give people the option of walking, biking, or using transit rather than driving. This results in lower greenhouse gas emissions and also promotes physical activity and more vibrant, healthy and sustainable communities. Forests, parks, agricultural lands and open space serve as “carbon sinks” by storing greenhouse gas emissions that otherwise contribute to climate change. Co-benefits of preserving open space and protecting local agriculture may include: making recreational activities available to community residents and, in some cases, reducing vehicle miles traveled. Providing reliable and objective information helps inform residents about the causes, impacts and possible responses to climate change. Involving the community in the development of proposed sustainability policies and programs builds buy-in and awareness. Providing practical information that helps individuals reduce their greenhouse gas emissions empowers them to take action and make a difference. For related information see the ILG’s Public Engagement program. This report details the innovative activities and everyday actions agencies are implementing to save money, reduce greenhouse gas emissions and improve the quality of life. View the plan and listen to Redlands Council Member Harrison discuss why the city used ILG's Sustainability Best Practices Framework to develop its Climate Action Plan.